Seasons come and go, but Moonstone Beach seems to look pretty much the same through the year (with the exception of some of the dune foliage, that is.) 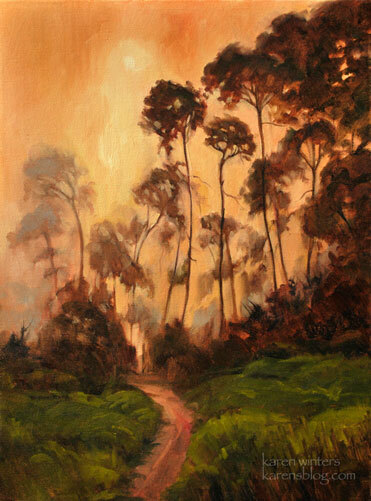 This is a place that I love to paint often. 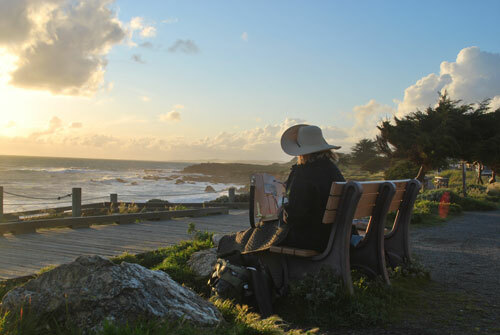 The first time I came here was during a paintout with the California Art Club, and I’ve returned many times through the years. 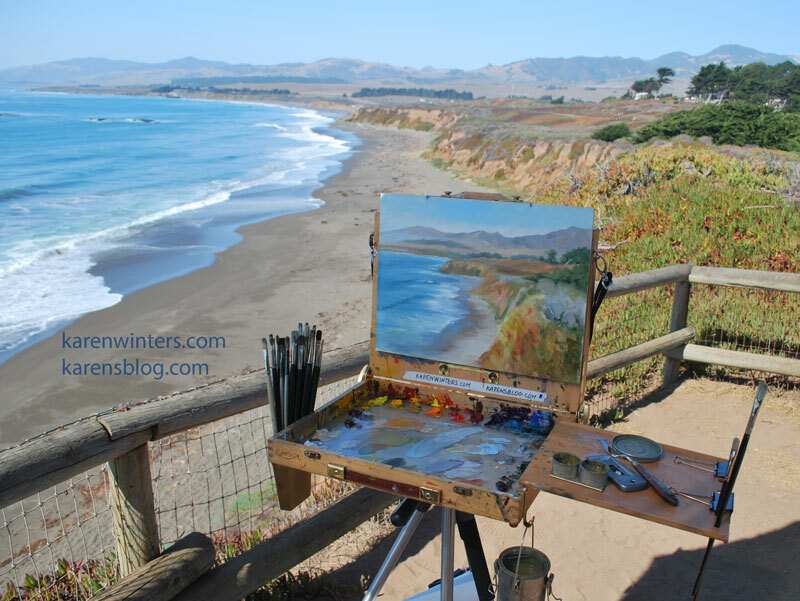 This was painted during the San Luis Obispo Plein Air festival, 2012 where I was one of a select group of invited artists. 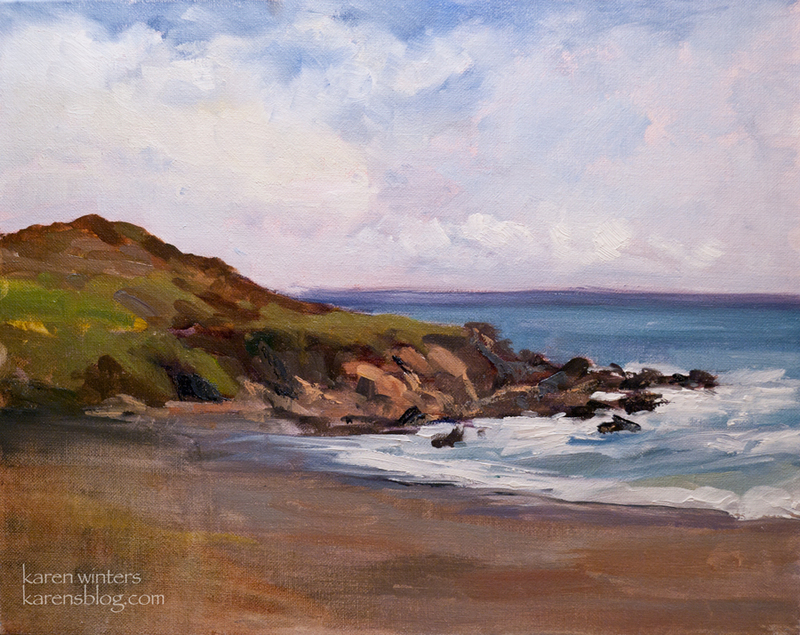 The colors of the beach and ocean really are amazing. 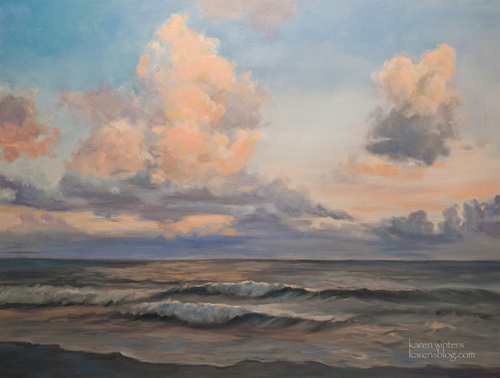 This painting, “Sailing Clouds,” is one of about 30 currently on exhibit for sale at Gale’s Restaurant in Pasadena, in my 2nd solo show at the venue. The opening reception is this Sunday, May 20, from 4-6 pm. All are welcome to come see some new art, and enjoy a wonderful wine and cheese event. Gale’s Restaurant is at 452 S. Fairoaks Avenue, Pasadena. 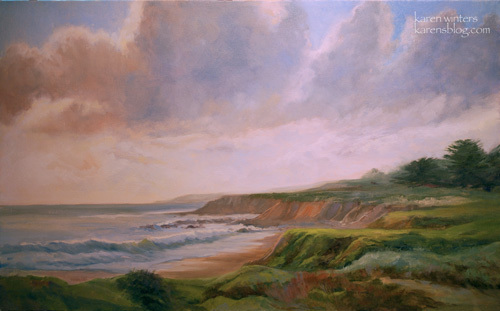 “Sailing Clouds” is from Cambria, California, on the southern edge of Big Sur. It’s an area where I love to paint small studies as well as larger studio works derived from those studies. The image is especially calming, and is a visual retreat for a busy, hectic day. You can almost see the clouds move if you sit quietly. Those words stuck with me as I saw these massive ships of vapor and moisture making stately progress across the horizon. I have always enjoyed reading poetry, both western and eastern, and find them to be good sources of ideas for titles of painting. Perhaps it’s because creating visual art and creating poetry are closely aligned. In both cases, the writer or the poet is pointing to an emotion beyond the literal representation of the subject. Much is suggested and implied rather than stated directly. Some art teachers describe a painting’s brushwork as being “poetic.” Conversely, we may describe a poem as “painting a word picture.” William Blake was one of the rare individuals who both painted and wrote poetry. Maybe one day I’ll post some of my old haiku here. 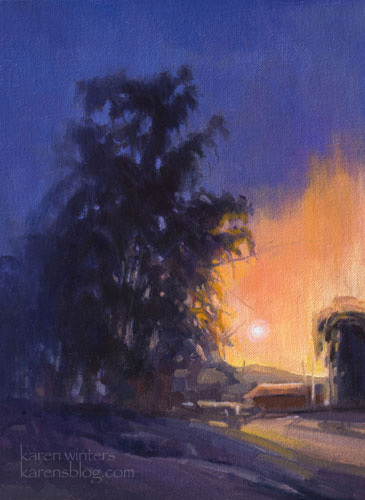 Coming up next: another plein air painting from the Tejon Ranch paint out last week. If you’d like to commission a custom painting of the California central coast or any location, please write. This painting was finished last April and in all the hustle bustle of getting ready for shows and paint outs, I neglected posting it here. 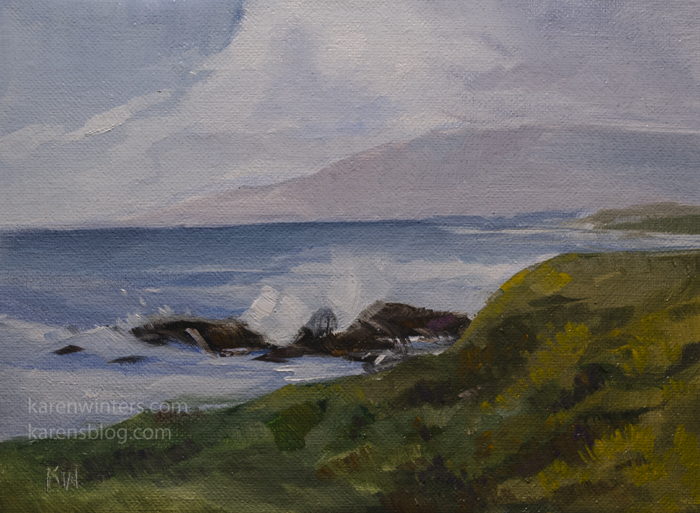 It was a studio painting, based upon smaller studies that I did ‘en plein air’ on location. This is a typical way for me to work – to study a subject from life, and then to produce larger pieces in the studio when I can explore them slowly and thoughtfully. 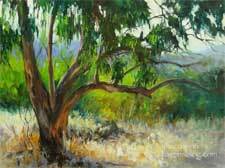 The original study was painted during a paint out with the California Art Club. This is a video my husband shot and edited – some highlights of me painting there. Please let me know if for any reason it doesn’t play for you. It is hosted on the Facebook server, not YouTube. 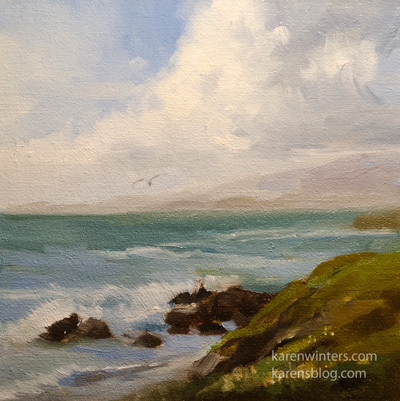 This painting was actually completed on location last spring on a paint out with the California Art Club, and due to an overload of work (and probably some forgetfulness on my part) it has been sitting in a dry box waiting to be discovered. In the process of cleaning up and organizing for the holidays I have uncovered more than a few paintings which I’ll be posting over the next few days/week. This painting of Moonstone Beach was done on a day when it was raining heavily inland in San Luis Obispo. One of our fellow painters, Karl Dempwolf, told us that the beach was clear up in Cambria, so we loaded in the car and headed for the beach. 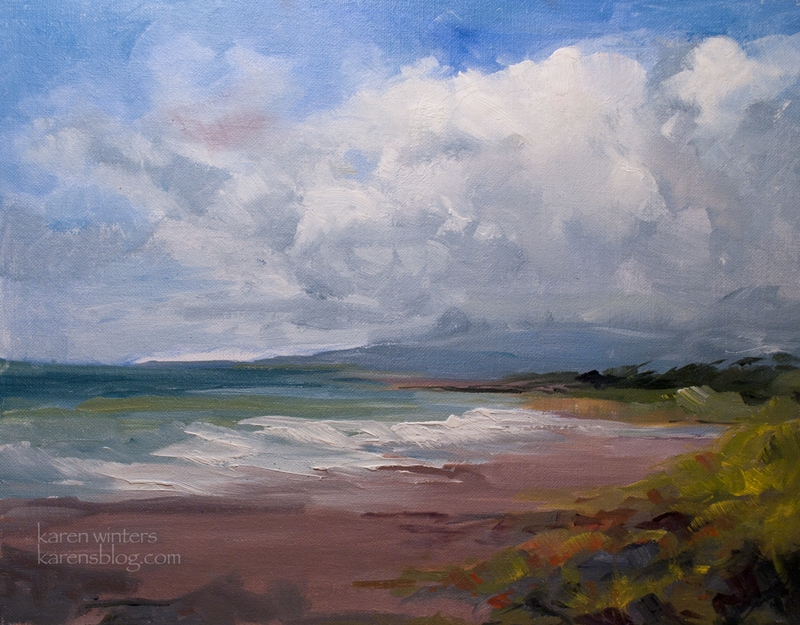 The wind was blowing heavily and my new EasyL easel had to be weighted down to keep from blowing over. It all worked out. Happy New Year to everyone. We’re staying in and staying safe tonight. It’s a very cold day in So. Cal, which is unusual even for December, so I’m catching up on my record-keeping and looking forward to some TV-watching later. Our kids gave us a beautiful new widescreen TV for Christmas and we’ve been completely entranced with it! 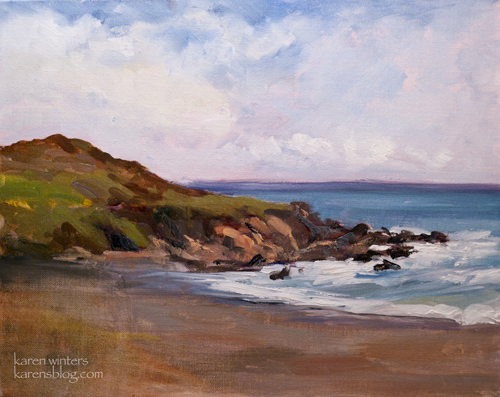 One of my newest paintings, “Cambria Sunset,” has been selected for inclusion into the Segil gallery Holiday Small Works show. 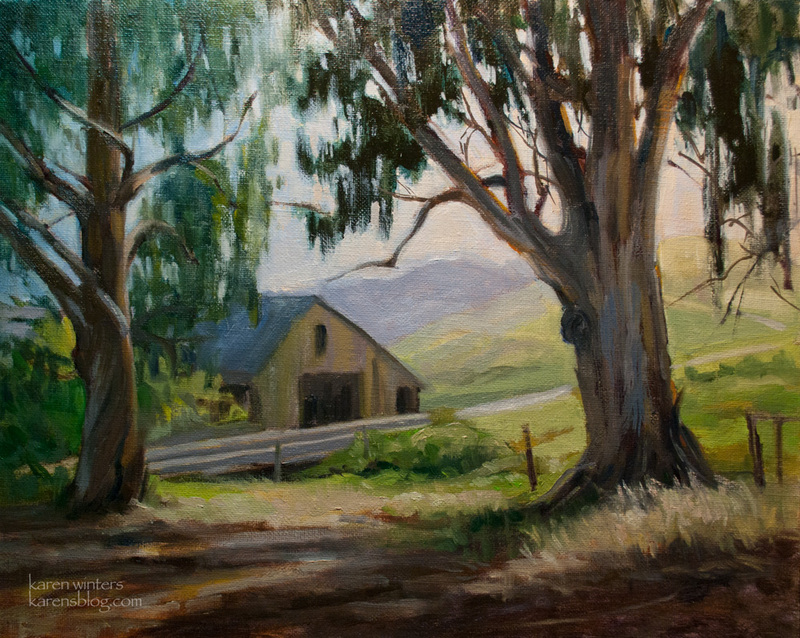 The painting features a rural scene along Santa Rosa Creek Road in Cambria (near San Simeon) and includes one of the dramatic eucalyptus trees so typical of that region. 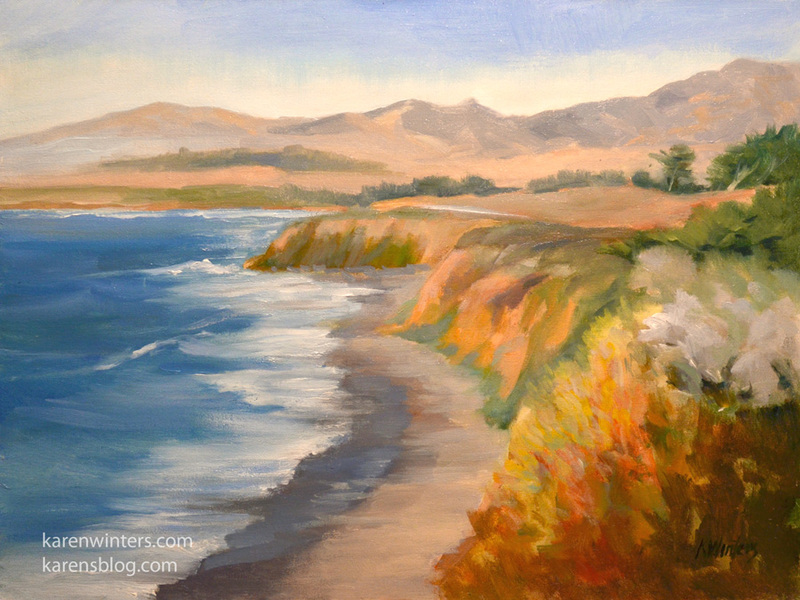 Among the places we painted in Central Coast was the Santa Rosa Creek Trail, which goes inland from Cambria. The trail is a part of the land cared for by the San Luis Obispo Land Conservancy, which hosted us on our paint out. Santa Rosa Creek winds through beautiful hills and valleys until it finds its outlet.